The short ones are about 3 ft out of the ground and the tall ones are about 6 ft out of the ground. Sorry SD I don't know. about 9 " I think. I just use my trowel as a measurer when planting. I thought they looked quite close together. Someone had told me I needed to leave a foot minimum between beans. I had visions of my frame crossing the width of the plot!! 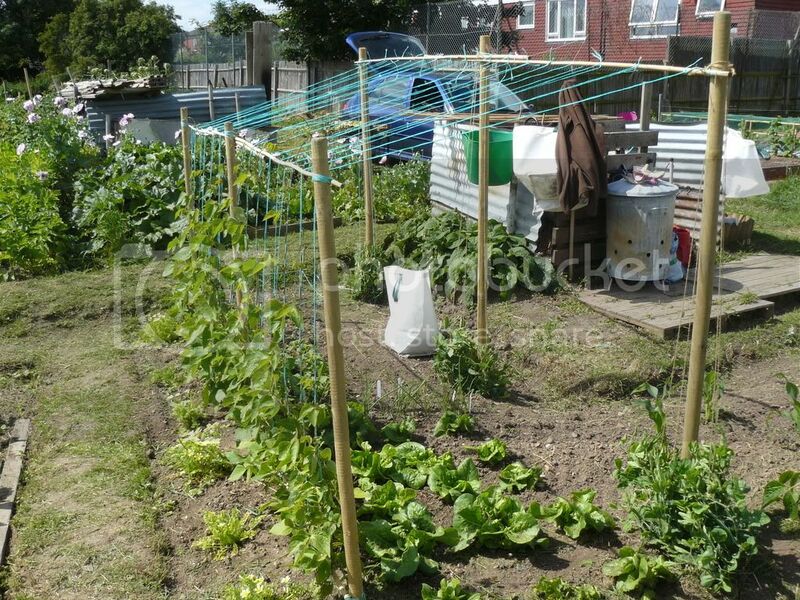 Does anyone know what the X FRAME for growing runner beans looks like. ? Someone posted on this thread that the x is tied in the middle and not at the top~~~ Is this stable ? 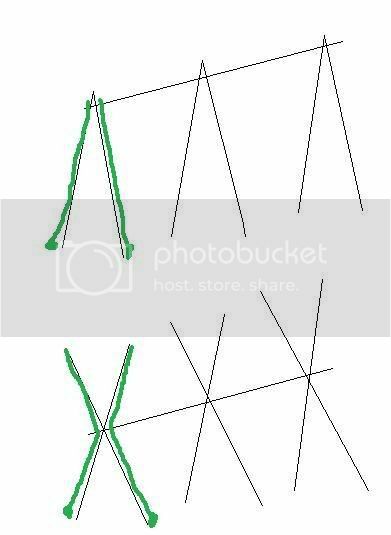 the x frame is a cross of wood .try branches of trees the strings are then tied to the upright points on both ends of the top sections . then hanging strings are then drop from these points so that you can infact have 2 lines of beans if you have a confined space . Hi. Newbie alert! 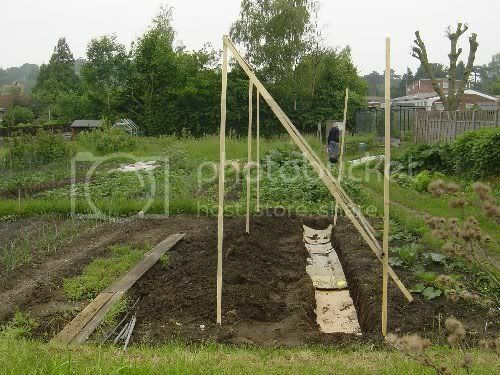 I was wondering whether - if I built the frame strongly enough-I could use it to grow a grapevine? I'd be training one stem up each 'string'. On a traditional row of beans, the pairs of canes are tied together at the top, so you end up with a triangle cross-section. The pairs of canes are then joined horizontally along the top with more canes. The problem with that, if you're only 5'2" like me, is that it's hard to harvest the beans towards the top because they are hanging down inside the narrow point of the triangle, at height. In this design, the higher beans are hanging down from the top half of the cane, thus being on the outside. and given that I've never used Paint before, that's what you're getting! 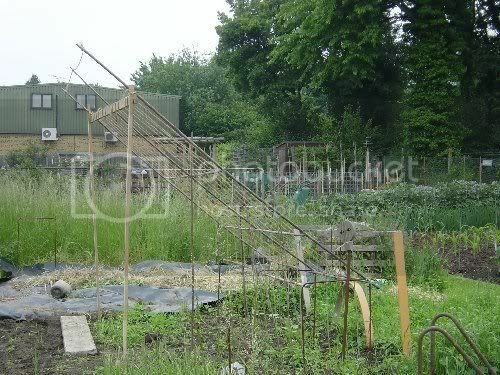 The traditional row of beanpoles is the top piccie; what I've constructed is the lower piccie. The green line is where I am telling my beans they are to grow ! Brilliant idea! I for one would buy one. Sal , it is an amazing construction I agree, did nt finish it in time for the competition ! Planted some courgettes under it yesterday . Will post pics when its covered with beans ,cant wait . What can I say but way to go! It looks fantastic.